The first Norwegian stamps, issued for the purpose of raising money for charitable purposes, appeared in 1930. These are regular definitive and commemorative postage stamps, but they have a "value added tax" or "surtax" on them, designed to raise money for national organizations, public events, and public charities. In this category, they will be referred to as "Charity Stamps". 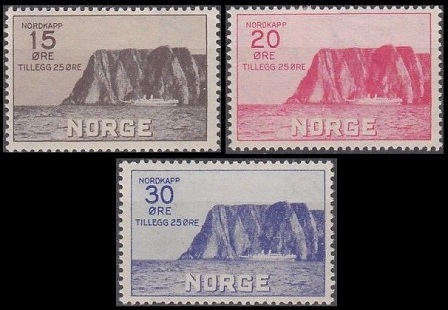 The three surtaxed pictorial Norwegian stamps shown above (Sc. #B1-B3) were issued on June 28, 1930. These stamps are printed on watermarked paper, perforated 13 1/2 x 14, and their size is 33 1/4 x 21 1/2 mm. The surtax benefited the Tourist Association. The common design features a view of the North Cape. 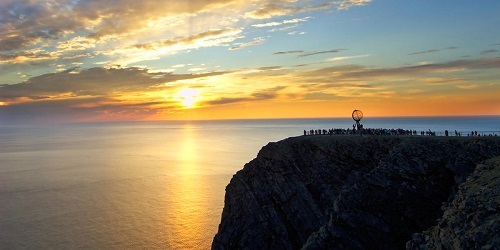 The North Cape is a cape on the island of Magerøya in Northern Norway. The 1,000 foot cliff is one of the principle tourist destinations in Norway, and it offers panoramic views of the Midnight Sun and the Barents Sea during the Summer months. It is one of the northernmost points in Europe, and it is only 1,300 miles from the North Pole. The 20 Ø. + 10 Ø. denomination surtaxed stamp shown above (Sc. #B4) was issued on April 1, 1931. 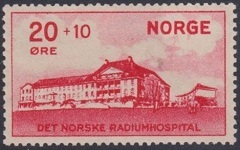 The surtax helped to build the Norwegian Radium Hospital, which is pictured on the stamp. The Norwegian Radium Hospital is part of the Oslo University Hospital, specializing in cancer research and therapy. In 2005, the Norwegian Radium Hospital became the Institute for Cancer Research and Medicine. The four surtaxed Norwegian stamps shown above (Sc. #B5-B8) were issued on December 13, 1935. The surtax benefited the International Nansen Office for Refugees. 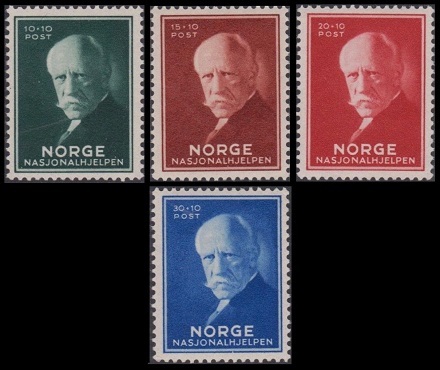 The common design features a portrait of Fridtjof Nansen. Fridtjof Nansen (1861-1930) was a Norwegian explorer, scientist, diplomat, humanitarian, and Nobel Peace Prize laureate. In 1921, he was appointed the League of Nations High Commissioner for Refugees, and in 1922, he was awarded the Nobel Peace Prize for his work on behalf of the displaced victims of World War I. Following his death in 1930, the League of Nations established the International Nansen Office for Refugees, to ensure that his work would be continued. The two surtaxed North-Cape-type Norwegian stamps shown above (Sc. #B9-B10) were issued on June 20, 1938. These stamps are printed on watermarked paper, perforated 13 x 13 1/2, and their size is 27 x 21 mm. The surtax benefited the Tourist Association. 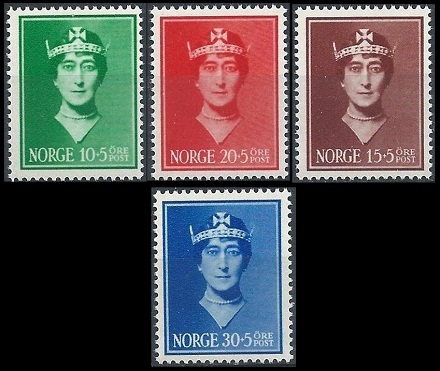 The four surtaxed Norwegian stamps shown above (Sc. #B11-B14) were issued on July 24, 1939, about eight months after the death of Queen Maud of Norway. The surtax benefited public charities. The common design features a portrait of Queen Maud. Maud Charlotte Mary Victoria (1869-1938) was the youngest daughter of King Edward VII and Queen Alexandra of Great Britain. In 1896, she married Prince Carl of Denmark, who would later become King Haakon VII of Norway. As the Queen of Norway, Maud supported many charities, especially those for the benefit of children and animals, and she also provided encouragement for artists and musicians. Maud died of heart failure on November 20, 1938, during a visit to Great Britain. 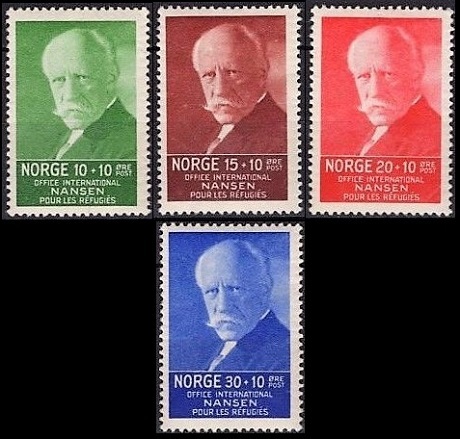 The four surtaxed Fridtjof Nansen portrait-type stamps shown above (Sc. #B15-B18) were issued on October 21, 1940. The surtax was used for war relief charities. Remember that the lots on European eBay sites are priced in EUROS or in POUNDS. Shipping charges may be more, and the lots may take longer to arrive. Also, make sure the foreign seller ships to your country, before bidding on or buying his lot.